Santa Claus is coming to town on Saturday, Dec. 8! Guests can partake in breakfast with Santa including pancakes, scrambled eggs and other items, while meeting and greeting with Jolly Old Saint Nicholas. Tickets are $10 for children (2-11 years old) and $15 for adults (12 years old and up). Additional fees may apply. Tickets are on sale now at MassMutual Center Box Office or online. 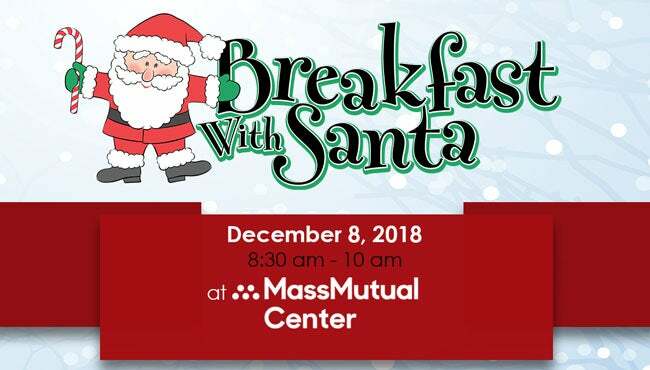 Attendance to the breakfast also includes free admission to the Boys & Girls Clubs of Springfield’s 18th Annual Festival of Trees at MassMutual Center, featuring over 130 unique and beautiful trees donated by local businesses, organizations, families and individuals. Proceeds will benefit the Boys & Girls Clubs of Springfield.